This episode, we will travel North to where light is scarce in winter and abundant in summer: Sweden. A musician and a saw-mill worker set to revive its small bagpipes in the 80s. These are known as the s?ckpipa. Sweden has a long history with bagpipes, and the sound of them, sweet and mellow is enough to convince anybody that they are also possible to play indoors. Come and discover the Swedish music of the long winter nights? Thank you to Stefan Ekedahl and Olle G?llmo for their expertise and help. Thank you also to Jean Pierre Yvert and Per Gudmundsson for their music. Visa fran Ostbjorka, with Olle G?llmo and Stefan Ekedahl on the s?ckpipa and Gunnar Borjesson , ?Olle G?llmo ? med pipan I sacken?, AWCD-61 2008. Polska efter Pelle Pettersson, s?ckpipa played by Ulf Karlsson, ?BlaBergensBorduner?, Amigo-1993. Sk?nklat efter Per Persson Menl?s, with Olle G?llmo on the s?ckpipa and Gunnar Borjesson, ?Olle G?llmo ? med pipan I sacken?, AWCD-61 2008. B?sna Tr?dgardsvals, with Stefan Ekedahl on the s?ckpipa, Jean-Pierre Yvert and Peter Rousu, Durspel I Dalarna, JPYCD-2009. Mallorca, land of sun and sea, but who knew it was also land of bagpipes? 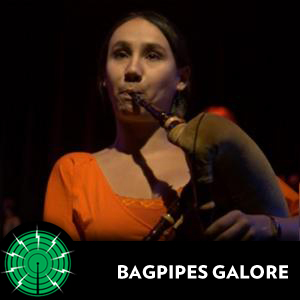 This episode introduces the xeremies, the... Read more..
A whole hour of bagpipe music for this special edition of Bagpipes Galore celebrating World Radio Day 2013. Here is a... Read more..
France is host to many different types of bagpipes but Gascogne has a special bagpipe, rediscovered at the bottom of a... Read more..